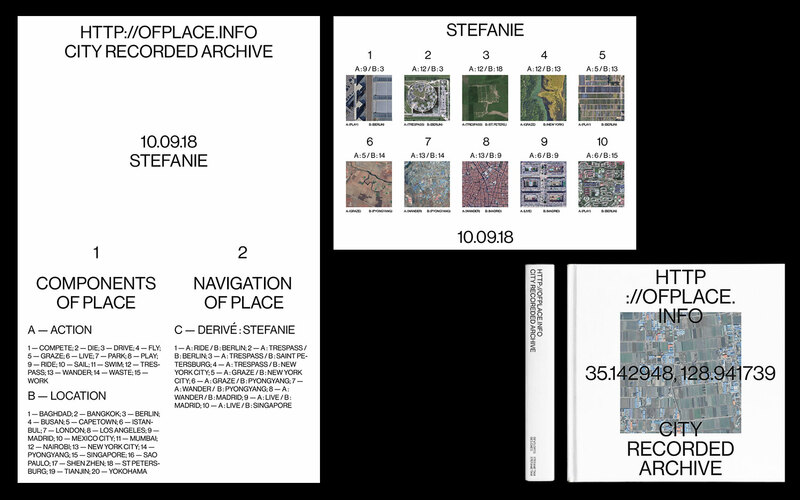 HTTP://OFPLACE.INFO/ is the result of an extensive surveillance collection of Google Maps satellite images. With choices dictated by randomization, pre-established rules, curiosity, and intuition, ://OFPLACE. archives 600 images of 20 different cities. ://OFPLACE. simultaneously compares and contrasts both basic and strange infrastructural features of various cities while it also allows the user to explore cities around the world in a way that’s dictated by intuition rather than preconceived notions tied to a specific location. ://OFPLACE. explores the relationship between print and web to reflect the contrasting nature of digital and physical within the quickly evolving landscape of contemporary design and art practices. Creating ://OFPLACE. was an exercise of transparent data collection and reflection of dispersion of information.